This mod removes the Depth of Field / Distant Blur from image spaces, in order to prevent distortions from the PRC Lens Aberration effect. Currently supports NAC and Vanilla / True Storms. Updated NAC version: Virtually all Image Spaces and -Adapters are now covered. This mod removes the Depth of Field / Distant Blur from Image Spaces and -Adapters, in order to prevent distortions from the PRC Lens Aberration effect. Currently supports NAC and Vanilla / True Storms. Install or remove the mod with your mod manager. Some interiors may conflict with Enhanced Lights and FX, so this patch would have to go first. Ideally also delete the Depth of Field settings yourself from ELFX image spaces. I strongly recommend Ultra Interior Lighting though for PRC (which does not conflict with NAC or this patch). While playing through the DLCs with PRC & NAC, i ran across some unedited vanilla weathers. The GIF animation above shows the glitch caused by Bethesda's Depth of Field in combination with the PRC Lens Aberration effect. 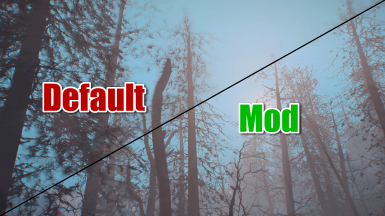 Since version 1.1 of this mod, all vanilla and DLC content should have their Depth of Field settings removed. Vanilla / True Storms is now also covered for users who prefer that over NAC.